On Friday and Saturday, 8/29 and 8/30, I had the honor of participating in the Delaware leg of an around-the-world relay to benefit Riders for Health, a charitable organization that provides effective transportation (mostly motorcycles) to physicians in sub-Saharan Africa. And you thought nobody makes hut-calls anymore! 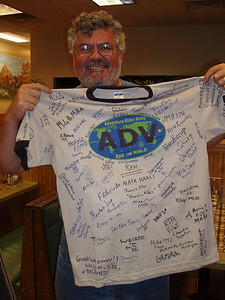 The relay was organized by some folks at ADVrider, the site for adventure-touring. What's being relayed you ask? 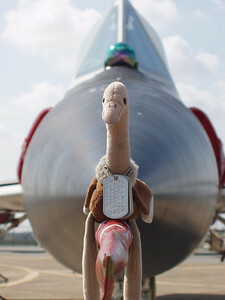 Believe it or not, a Beanie-Baby ostrich named "Pooey" (ADV insider joke). By the time I took the hand-off from the Pennsylvania rider on the rainy night of 8/29, Pooey and the waterproof case in which he travels, together with a journal, ever-accumulating bric-a-brac, and a t-shirt signed by each rider that will eventually be given to the wife of a fallen ADVrider member, had traveled through most of the US (including Alaska) and Canada. 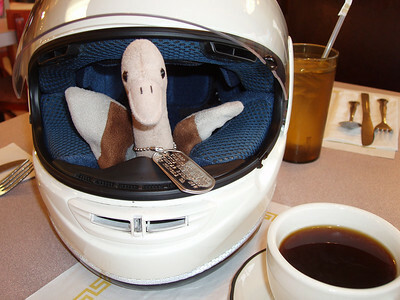 On 8/30, I and my two Delaware cohorts, Jeff ("olenuf2nobetter" on ADV) on a Buell Ulysses, and Dee on her Sportster, showed Pooey around much of Delaware, including historic sites in Newark, Wilmington, and Dover. At the end of a long, hot humid day we handed-off Pooey and the case to the Maryland lead rider in Chestertown, MD. The case and contents will shortly be shipped to Hawaii to complete the US leg, and from there it goes to Australia to begin the long way 'round. Read the full report of Pooey's travels through North America in this thread on ADVrider. My and Jeff's reports (and many more pix) regarding the Delaware leg are here at post nos. 1211 and 1212 on page 81. Nice work! Did you notice the other comment? An award?